Already blessed with some innovative fine dining options, with the opening of the stylish wine lounge and global cuisine restaurant L'Angoor, the choices have just gotten better for Gurgaon's professional community. In the burgeoning Indian world of fine dining, culinary wizards and wine stewards are rewriting the repast rituals. 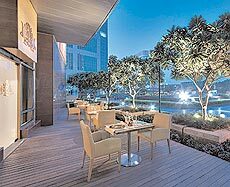 Now, L'Angoor promises to give stiff competition to the established eateries with a swank wine lounge helmed by resident sommelier Davide Zubani while executive chef Hitesh Gupta dazzles diners with his platters of chic eats. The 40-cover restaurant at the Global Business Park in Gurgaon is neatly sliced into a bespoke lounge area and natural oak-wood dining space awash with warm lighting. You can hit the culinary trail at L'Angoor with a zesty orange and fennel salad studded with succulent prawns or some spicy mozzarella samosas, which go down well with a glass of Felton Road Riesling 2008, redolent of ripe apricots and summer blooms. Zubani guides you through an extensive wine list featuring vintages like Chateau Latour and Chateau Mouton Rothschild from France, Barbaresco from Italy and Opus One from the US. All the 130 labels of wine, priced between Rs 1600 and Rs 40,000 per bottle, are stocked in a temperatureand humidity-controlled cellar. Besides wine, tipplers can also choose from a wide variety of single malts, liqueurs, and other spirits. Complementing the fine spirits are luxurious fare such as Blue Swimmer Crab Cakes, Crunchy Apples and Gulf Prawns Wrapped in Chicken, Broiled Lobster Tail with Spicy Pomegranate Sauce as well as Seared Alaskan Halibut. Presentation is given top billing. The chilled melon soup comes in a martini glass, streaked a funky crimson with red watermelon and white musk melon. 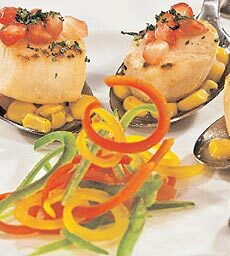 Equally charming is a scallop appetiser where the juicy mollusc is served on a giant spoon over a bed of golden corn mush and embellished with pomegranate seeds. But the restaurant's obsession with shape and texture is best reflected in a luscious kaffir lime ice cream that's daintily scooped inside a whole orange shell. Gupta aims to tease the palate with a starburst of Indian flavours like curry leaves, coconut milk, and mustard seeds that accent Western dishes like seared prawns. Even the lamb consommÃ© scales new heights with a smidgen of coriander. L'Angoor takes its liquor seriously, so prepare to be serenaded with chicken marinated in Cabernet Sauvignon, potatoes stuffed with lamb braised in Shiraz and more. The dessert offerings do not skimp on liqueurs either. The most glamorous entry in this section is the Groppino, a whipped concoction comprising Prosecco, an Italian white wine, lemon sorbet and vodka. The nonalcoholic stars of the dessert menu include mango mascarpone as well as homemade ice creams with quirky flavours like midori and rose petal. While dinner is an elaborate multicourse affair, lunch is more casual with sandwiches, artisanal burgers and pastas. L'Angoor is glamorous and experimental in equal measure. A dinner at this outfit can only be described as an exercise in culinary excess. Well, the guests definitely aren't complaining! Meal for two: Approximately Rs 2,500 without liquor. At: Global Business Park, Gurgaon. 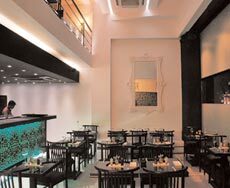 Mumbai's two one two offers delightful delicacies. Named after 212 degrees Fahrenheit, the boiling point of water, Two One Two in Worli is done in pristine white interior with allwooden flooring. The menu is crisp and the portions large. Start with the delightful wood-fire oven-baked Camembert cheese with grilled vegetables, bread sticks, and rocket leaves is a delight. The Quattro formagi pizza is a succulent celebration of cheese-mozzarella, gorgonzola, fontina and taleggio are all present- but the margarita somewhat suffers because of the multiple flavours that the four-cheese pizza offers. Among the entrÃ©es, the flamboyant and flavourful mushroom risotto with parmesan shavings is a must-try. Among the desserts, the blueberry cheesecake is outstanding and certainly better than most of its kind, as is the gooey chocolate fondant. The service is extremely attentive and the attention to detail impressive. Meal for two: Rs 2,600 sans alcohol. At: 12 A Hornby Vellard Estate, Worli, Mumbai; Phone: 022-24901994. Le Pain Quotidian, one of the world's best known bakeries, sets up shop in Mumbai. The downtown dining scene just got more exciting. Adorning the heritage structure of Dhanraj Mahal at Apollo Bunder is the newest entrant in the Indian market, Belgian bakery Le Pain Quotidian. Like most LPQs in the 30 countries across the world where it has a presence, the Mumbai cafÃ© has trademark patchwork on its walls, refurbished Belgian wooden furniture and communal tables. The secret of LPQ's success is a simple one: hand-rolled bread. In fact, to this day, Le Pain Quotidian (which is French for 'our daily bread') is renowned for breads made with organic, local produce. You can find them crowding the display, from rye breads to multi-grained breads, with each loaf weighing over a kilogram. The best way to enjoy it is to also order the bread basket. The Indian outpost of LPQ is full of surprises. The bakery opens for breakfast at 8 am and closes post-dinner; with the last order at 11.30 pm. For lunch, we start with the traditional LPQ speciallemonades and tasty chicken pesto tartines (open sandwiches). The salmon salad overshadows its vegetarian counterpart by a mile. The generous use of parmesan shavings and salmon with a little balsamic dressing provides texture to the rocket leaves. The best way to enjoy it is to also order the bread basket, which contains a selection of LPQ's breads. The hot chocolate is a delight as is the hot cocoa that washes down the delicious apple crumble pie. LPQ doesn't disappoint on the views either. A cool sea-breeze tempers the weather at the outdoor seating area which offers a view of the Gateway of India and the Arabian Sea in the background. A quintessential Mumbai view for a great new eatery. Meal for two: Rs 1,400 sans alcohol. At: Dhanraj Mahal, Apollo Bunder, Colaba, Mumbai. 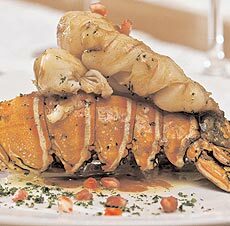 French food takes courage and Chez Vous, a new Gallic restaurant in Mumbai, has it in spades. Now if only the service would improve. Bringing a new cuisine into the city is big news. And yet, Chez Vous-French for 'your home'- is surprisingly small. Though the bistro's multi-level seating makes it look larger than it really is, the place accommodates only about 40 covers at one go. In sync with its theme, the eatery is designed with overstuffed sofas and table arrangements and chairs that bring to mind Parisian cafÃ©s. Chez Vous is a new Gallic restaurant in Mumbai. Chez Vous' menu is a little haphazard. There are different menus for snacks, lunch and dinner. There's also a regular multi-course meal offering alongside a long list of burgers and sandwiches and a multiple meal combo option. Ordering here can be confusing, to say the least. Although the staff don't always know their way around the wine list, their meal recommendations are worthy of praise. The succulent, Chunky Chicken Breast with Pesto Sauce, served with potato and cottage cheese is sumptuous. The Rare Salmon Fillet served with mashed potatoes comes with a wonderful balsamic sauce, making it one of the best dishes on the menu. The vegetarian burger is kind of overwhelmed by molten cheese, which draws attention away from the juicy patty and the dressing that coats the inside of the bread. The creamy absinthe cocktail definitely helps lift the mood, as do the desserts that follow. The dual sorbet with fruity options (the guava and watermelon version is really good) served with coffee ice cream is worth a try. While bringing in a rather bland cuisine definitely gives Chez Vous' owners something to be proud of, the food needs to be consistent, the service needs to improve. Perhaps, providing such an extensive menu is not that good an idea. But operations are bound to get better soon, we're told. We're waiting. At: Eros Building, M.K. Road, Churchgate, Mumbai.